Fra Mudest – a jolly friar who always ends up in a pickle – is a household name in children’s literature and many a generation has grown up laughing out loud at the antics of the friar. Penned by Charles Casha, they were first published as magazine short stories in 1967, then four years later Fra Mudest was published as a book collection, the first ever Maltese children’s book to be published in Malta. 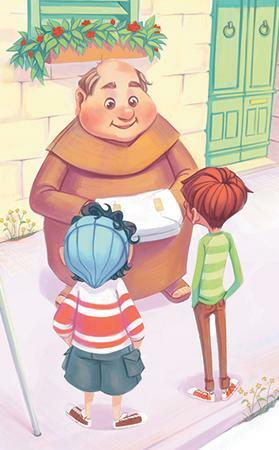 Now, the chubby friar has been given a makeover, making him accessible to readers as young as seven years of age. A new Merlin Publishers series will see Fra Mudest star in shorter stories which have been simplified by the author. Each book contains one short story, with a contained amount of text making it the perfect length for young children just developing the confidence to read their first ‘proper’ book. The friar has also been given a facelift with new illustrations by Deandra Scicluna, who kept the retro ambience of the 1970s period when Fra Mudest was written, but at the same time giving the characters a fresh look. Fra Mudest u l-Figolla tal-Pirjol is the first book in the series and is printed in a sizeable and easier-to-read font on matt, yellow paper, specifically aimed at helping children with reading difficulties. Fra Mudest u l-Figolla tal-Pirjol is available from all leading bookshops or directly online, with free postage to Malta and Gozo addresses, from merlinpublishers.com.